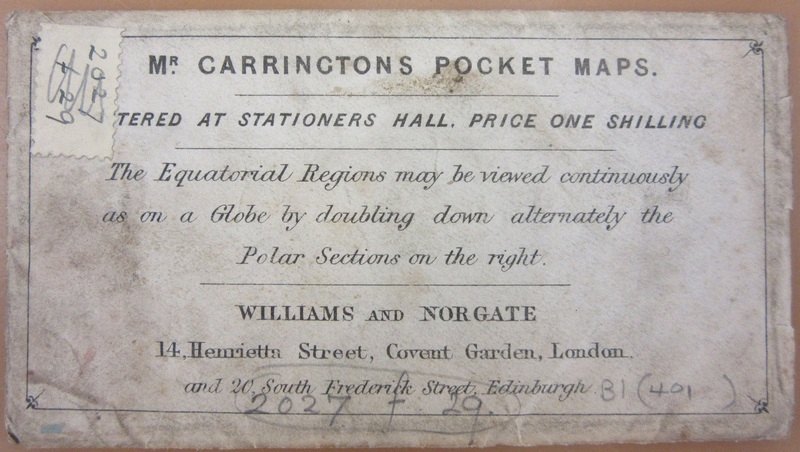 These small maps, dating from 1864, are designed to fit in the pocket of a waistcoat or jacket. Usually maps of this type are travelling maps and often have timetables included, there are also examples for fox-hunting meets, so to have a World map done in this way is rare. Showing the equatorial regions with the polar regions at the right the idea is that in folding over the right-hand section of each side you create a wide span of the world. It’s hard to see the use though after the novelty effect of the map has worn off as the scale is such that only the barest information such as relief and major rivers is shown. 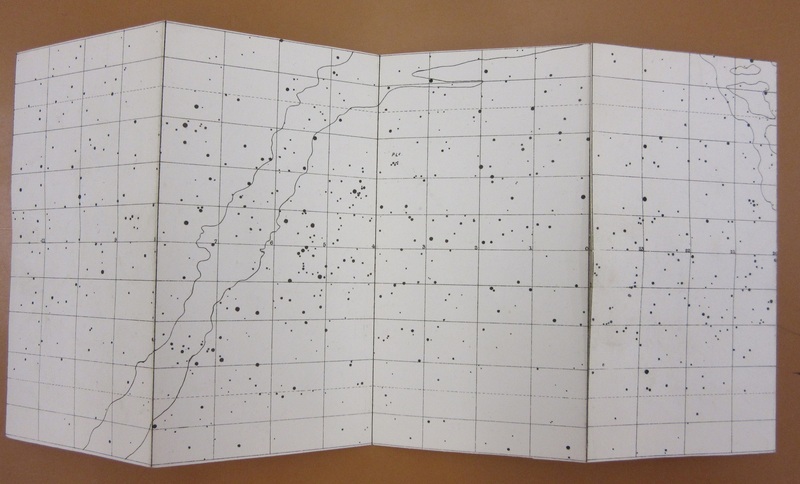 The second map, of the constellations, works on the same principle. 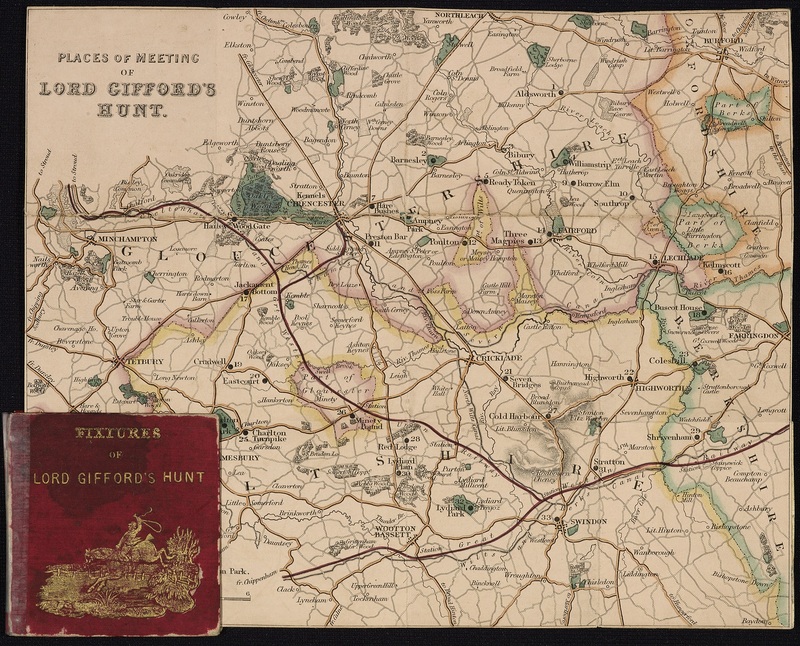 much more suited for purpose ( Places of meetings of Lord Gifford’s hunt, 1843, C17:7 g.1). This entry was posted in Uncategorized on 29 November 2018 by stuart. 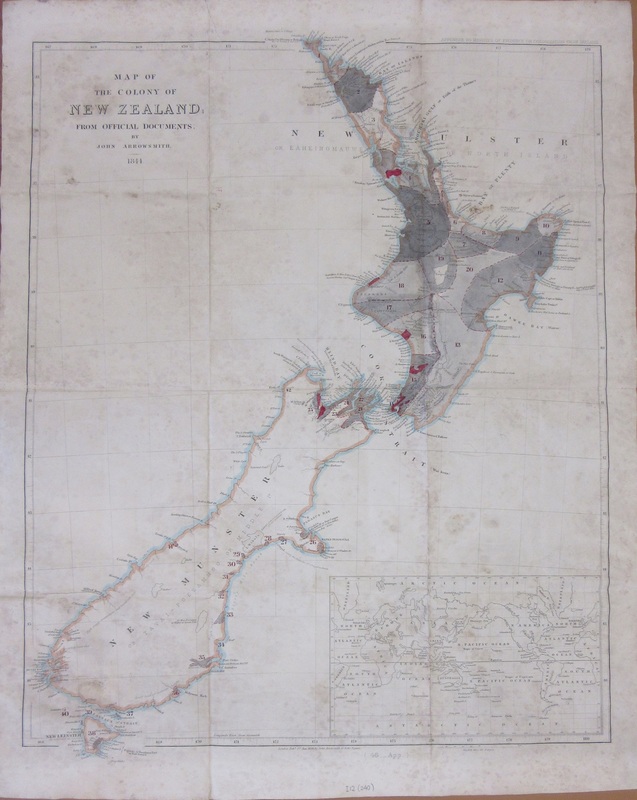 Two early maps of New Zealand, both from the 1840s, which use different names for the three islands. Polynesian settlement dates from around 900, with Abel Tasman being the first European to see the islands in 1642. The Dutch named the islands Nova Zeelandia after the province of Zeeland in 1645 which was then anglicised by Capt. James Cook in 1770. 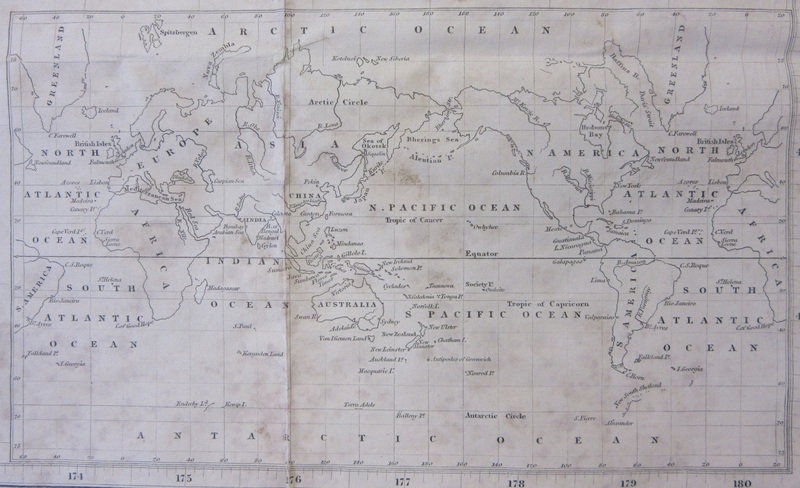 This first map is by the cartographer John Arrowsmith in 1844. 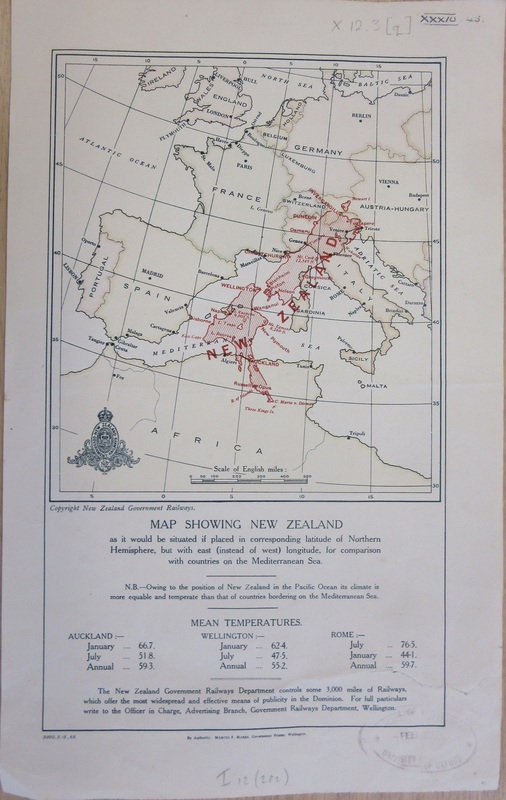 Map of the Colony of New Zealand from official documents by John Arrowsmith and shows how, just 4 years after the Treaty of Waitangi signed between the British and Maori recognizing British sovereignty over the islands the land was already being allocated to European settlement. The islands have unfamiliar names; New Ulster, Munster and Leinster suggesting a strong Irish settlement but in fact come from a new Constitution of Government sent from London in 1846 to replace an earlier unpopular one. The Islands were to be divided into two provinces, Ulster and Munster, with two Governors. Bizarrely the Islands weren’t intended to be split between North and South but on the line of the River Patea, in the North Island, with everywhere north of this to be New Ulster, everywhere south to be New Munster. There was no mention in the new constitution as to why these names were chosen. Arrowsmiths map of 1844 seems to be a reprint of an earlier map from 1841 with additional land ownership information. 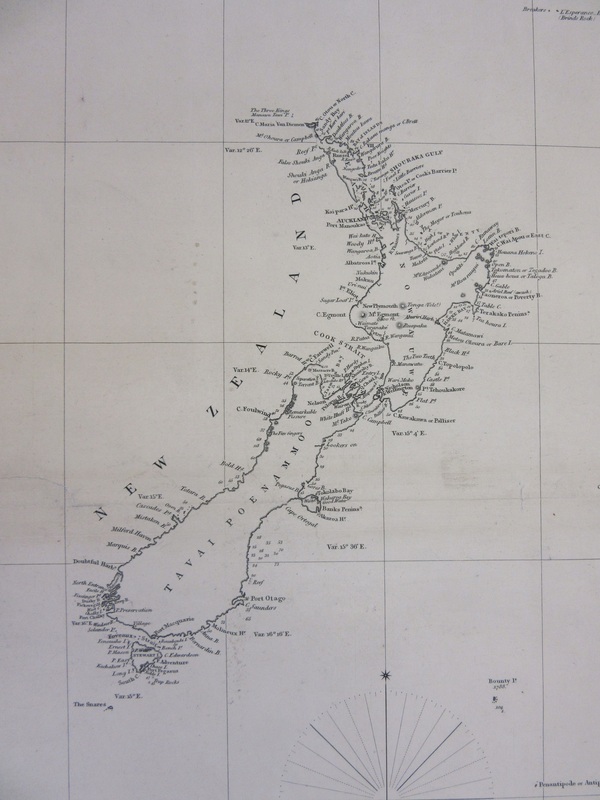 Arrowsmith produced maps of New Zealand at this time for official Government reports, and it is likely that this map accompanied a select Committee report on New Zealand from 1844. 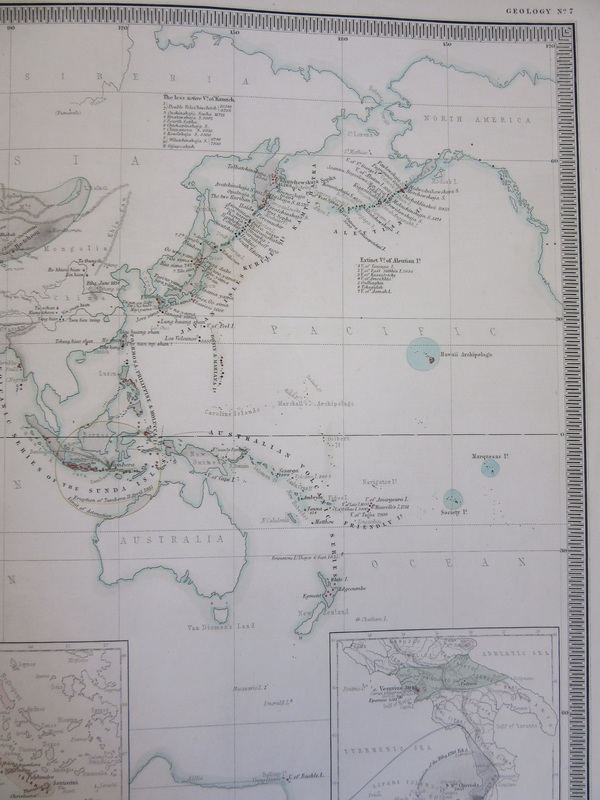 This second map, an extract from New Zealand and Oceanic Islands, dates from 1847 and uses Maori names for the two large islands. The third map is a strange one for a number of reasons. The map, Map showing New Zealand as it would be situated if placed in corresponding latitude of Northern Hemisphere, but with east (instead of west) longitude, for comparison with countries on the Mediterranean Sea dates from 1968 but places New Zealand over a pre-World War One map of Europe (note the existence of the Austro-Hungarian Empire and pre-war Germany) but in trying to encourage emigration into the country by suggesting temperatures are similar to favourable European countries the text isn’t entirely honest. Auckland’s mean temperatures are compared to Rome despite being closer to Algiers and doesn’t include anywhere on the colder South island. 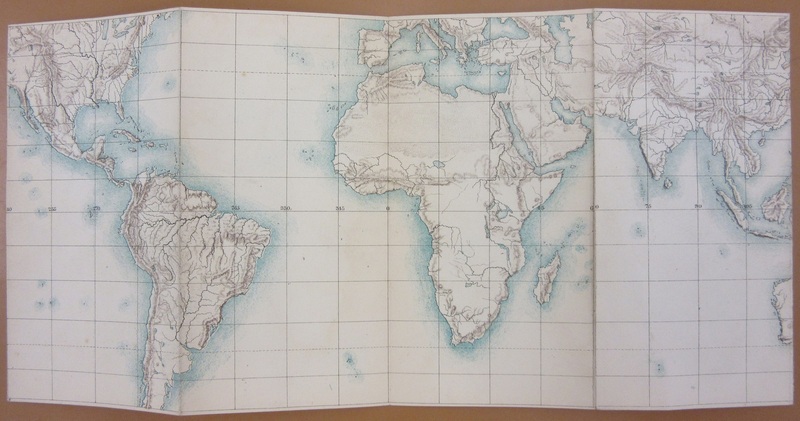 Finally an inset from the 1844 Arrowsmith map showing a World map with New Zealand in the middle. This entry was posted in Uncategorized on 19 November 2018 by stuart. 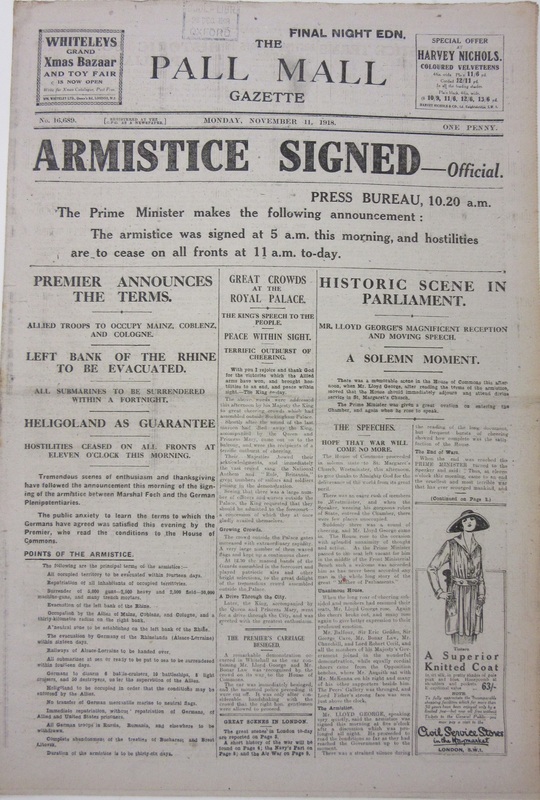 Maps and other items from the Bodleian to mark the anniversary of the signing of the Armistice. 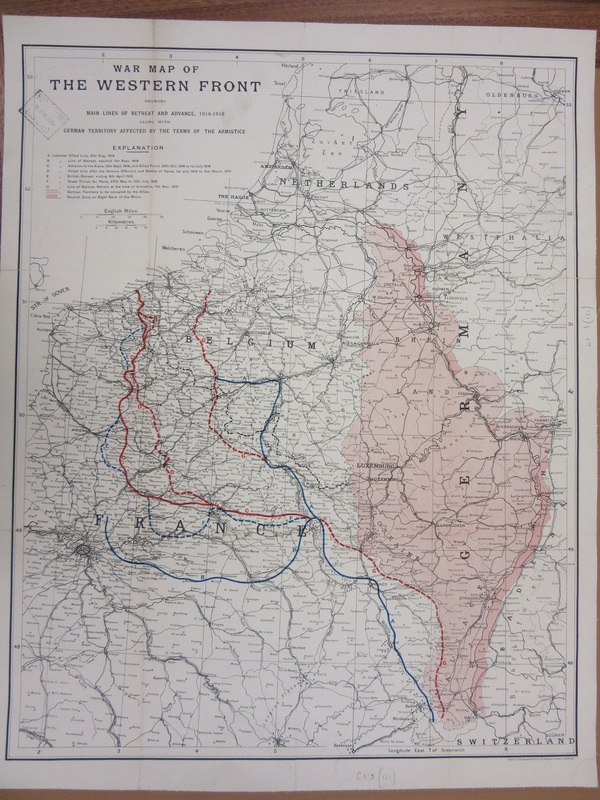 First a War map of the Western Front showing main lines of retreat and advance 1914-1918… (1919, C1:3 (121). The blue line running north is the front-line in August 1914, the broken red either side is the front-line at the signing of the Armistice four years later. Other lines show the front after key battles while the red shaded area is land to be occupied by Allied troops. 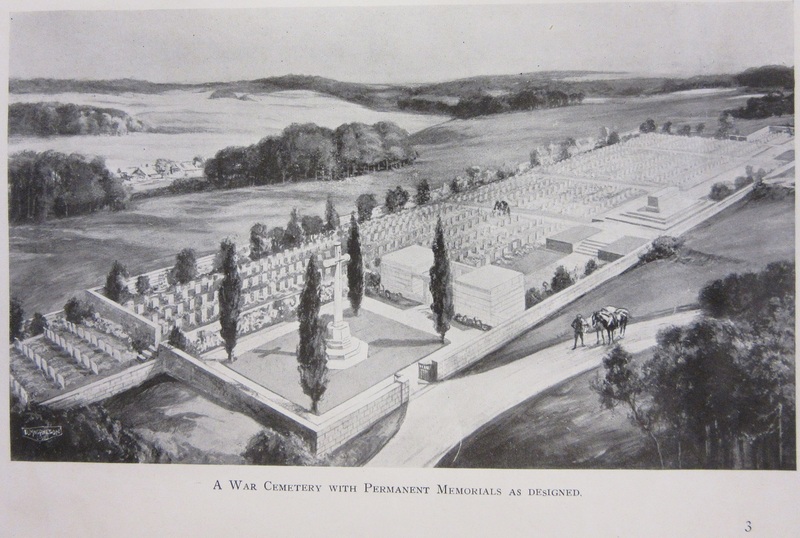 which gave an idealized view of the cemeteries with trees and plants, which was in contrast to the bomb-scarred landscape left over from 4 years of fighting. This next item comes from the Bodleian’s Music Department. 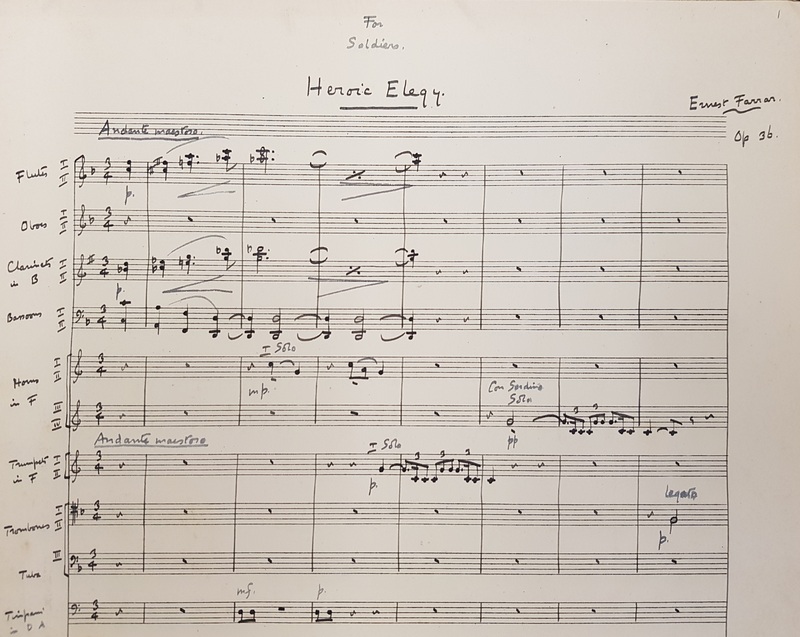 Ernest Bristow Farrar (1885-1918) was a promising young composer and organist who was educated at Leeds Grammar School and studied with Charles Stanford at the Royal College of Music before settling in the North, firstly in South Shields, moving to Harrogate in 1912 . He completed his Heroic Elegy in May 1918 whilst training at Raglan Barracks, Devonport as a 2nd Lieutenant with the 3rd Battalion Devonshire Regiment. The work bears the dedication ‘For Soliders’ and Farrar conducted its first performance whilst on leave in Harrogate on 3 July. 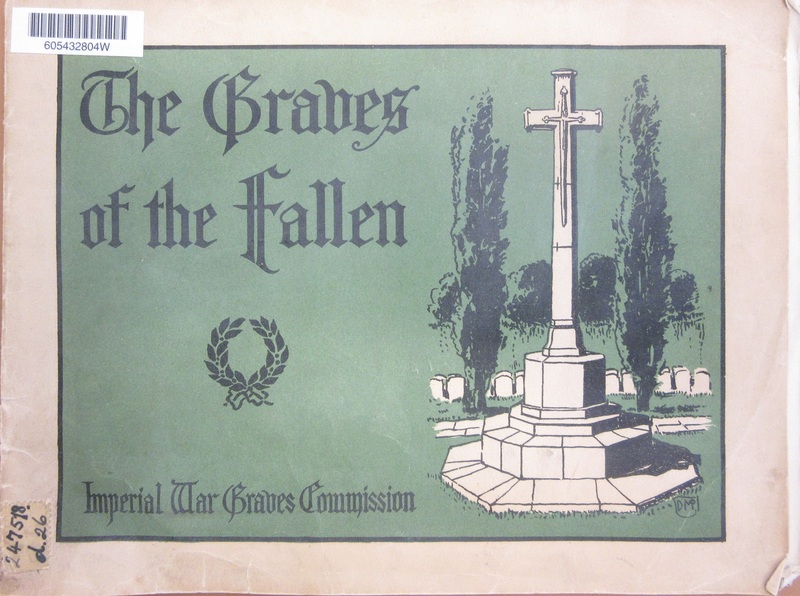 He finally left for France on 6 September but, after only two days on duty at the front, was killed on 18 September leading his men at the Battle of Epéhy Ronssoy, just a few weeks before the Armistice brought hostilities to a close. The piece is a moving tribute to his fellow soldiers and incorporates bugle calls and strains of the 15th-Century Agincourt Song into the music. This is an extract from the manuscript of the work held in the Bodleian. Farrar is buried In Ronssoy Communal cemetery (grave B.27) about 15km north-west of Saint-Quentin. 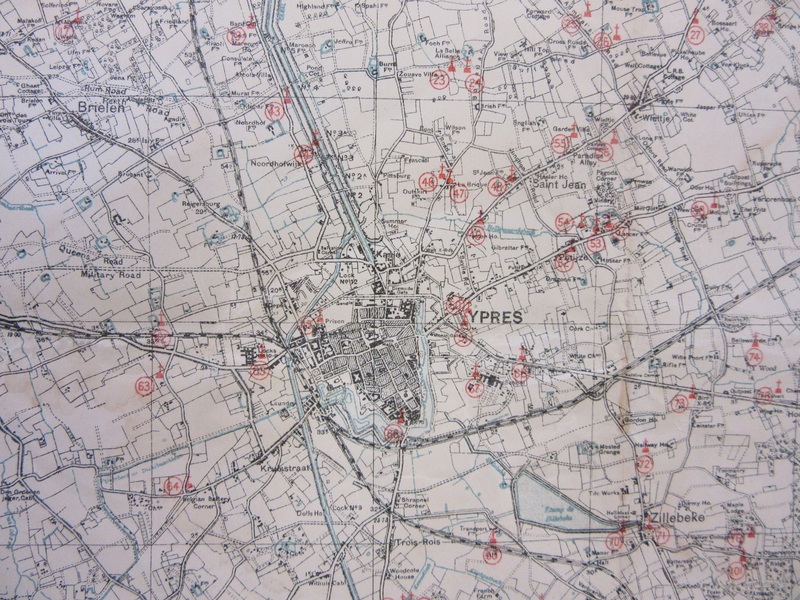 Finally maps to show War Graves around the Ypres area. The red crosses mark a Commonwealth Cemetery. with extracts, first of the area around Zonnebeke. Just off the map at no. 31 is Tyne Cot Cemetery, the largest Commonwealth War Graves cemetery in the World. And to finish, an extract from a trench map made at the end of the Third Battle of Ypres, just after the capture of the village of Passchendaele. 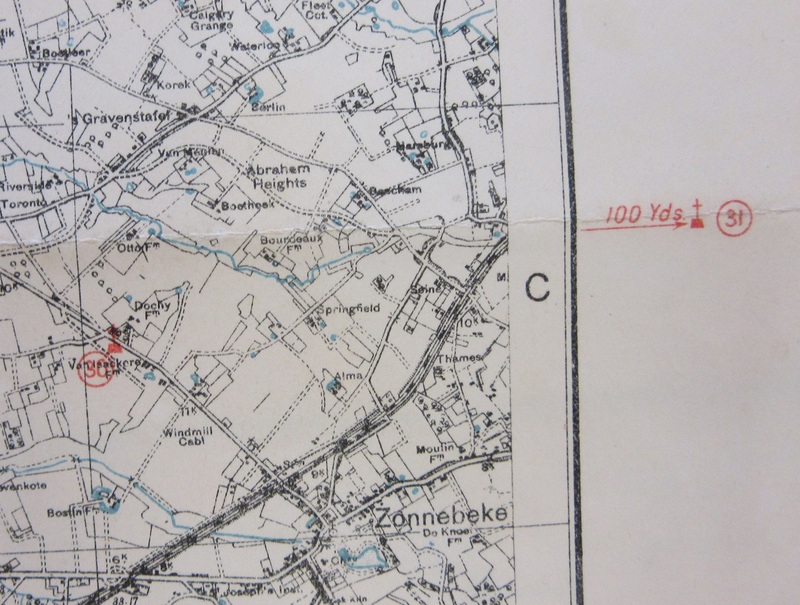 At the bottom of the map is the hamlet of Tyne Cott and the start of the Allied cemetery. 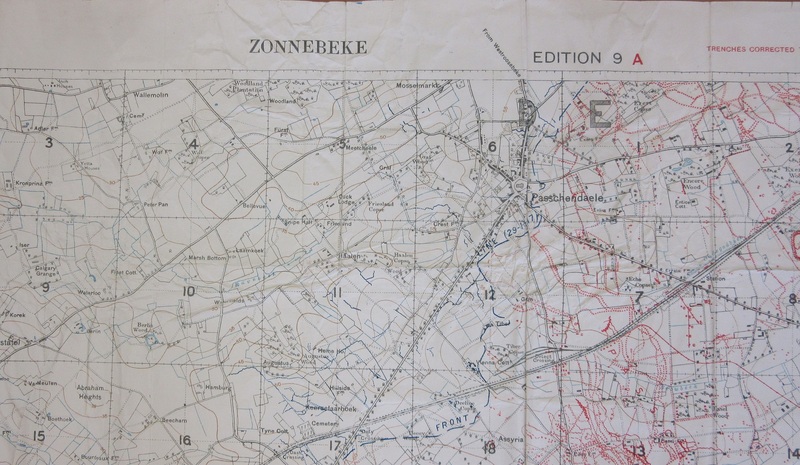 Extract from Zonnebeke 28 n.e. 1, Dec 1917, C1 (3) . This is the 9a edition of a sheet updated throughout the advance made by the Allied troops throughout the battle. British trenches in red, German in blue. 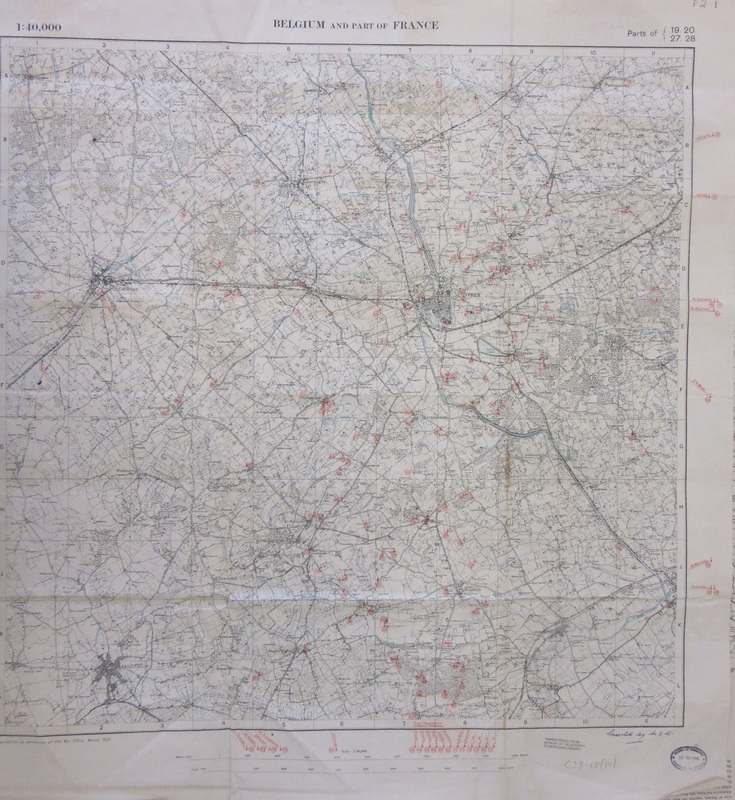 Trench maps very rarely show British trenches in too much detail in case the map was captured by the enemy. * With thanks to our colleagues from the Music Department for the piece on Ernest Farrar. This entry was posted in Uncategorized on 9 November 2018 by stuart. 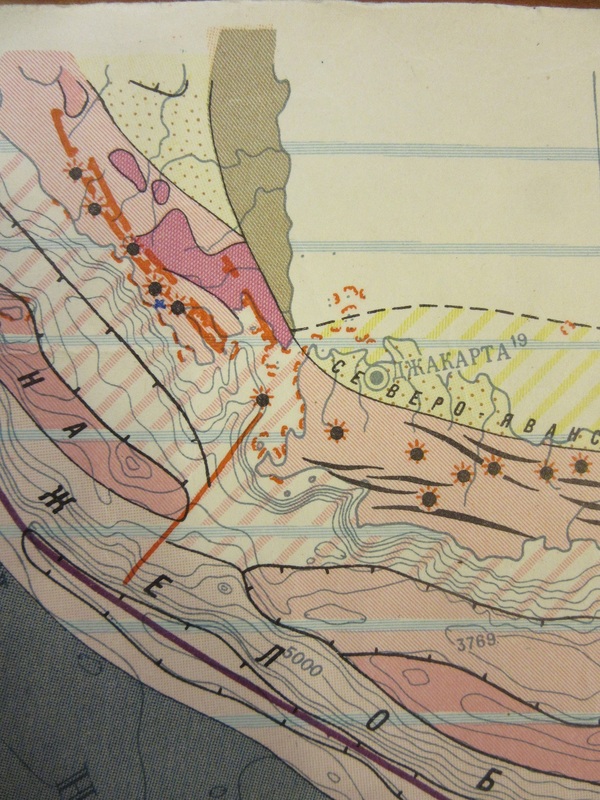 This large (2.5 by 2.2 metres), colorful and complex map of Pacific tectonic activity was produced by the Academy of Sciences of the Soviet Union. 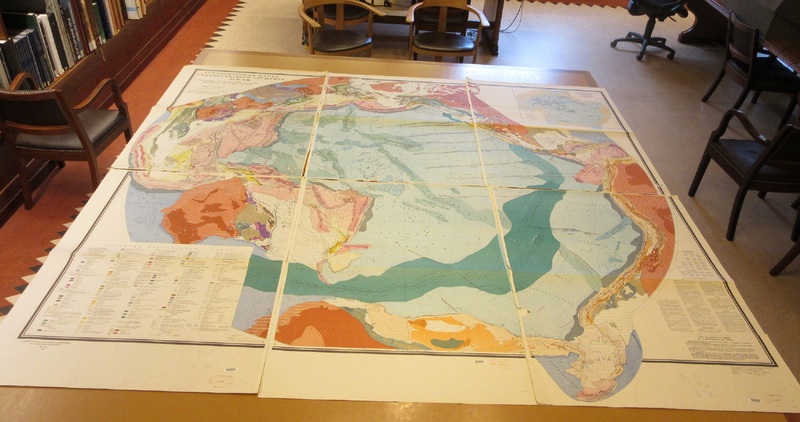 Printed on 6 sheets the Tectonic Map of the Pacific Segment of the Earth, spans an area from the Bering Straits in the north to Antarctica in the south, from the Americas in the west to the countries of South-East Asia. This is a large map covering a large area. the projection means the countries portrayed follow the curvature of the earth, so the Americas starts at the top middle and then goes down the right-hand side of the map while the Soviet Union and then the countries of east Asia; China, Malaysia, Cambodia and so on are on the left. Australia is above the legend on the bottom left sheet. 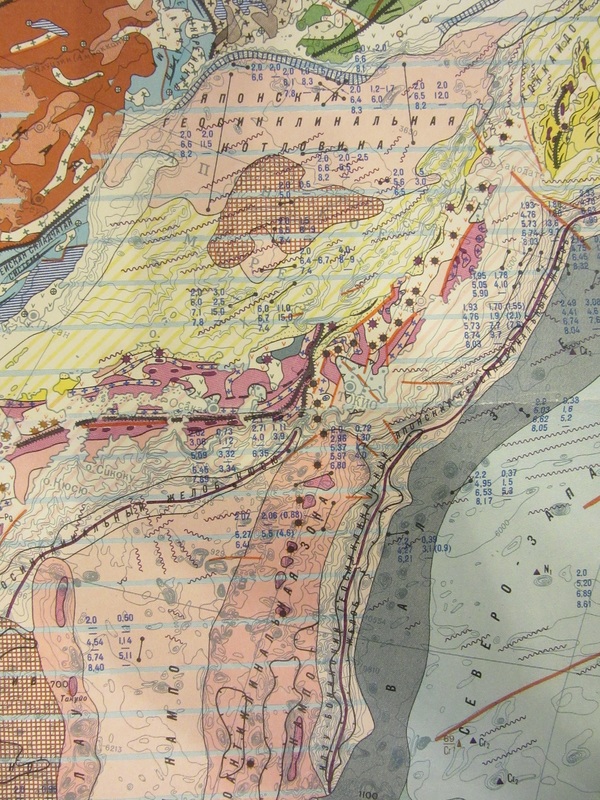 Japans complex geological make-up can be seen by the amount of detail overlaying the islands. 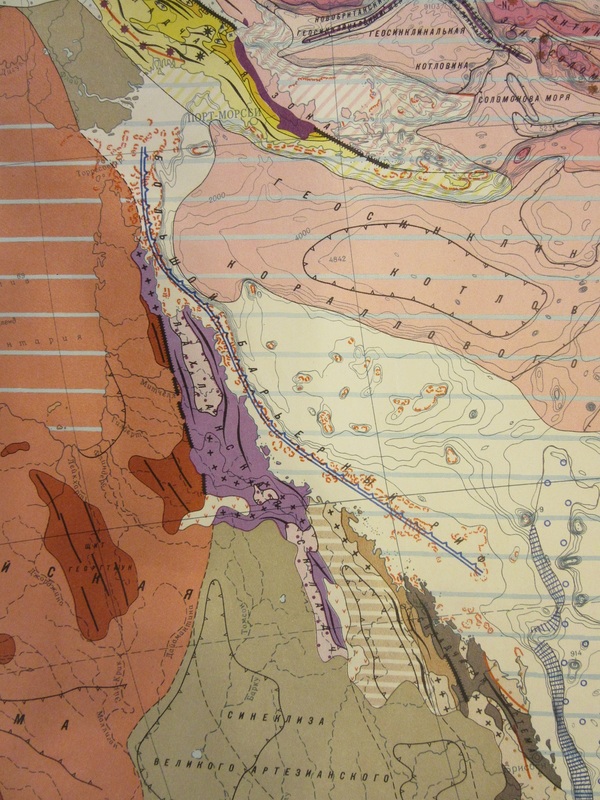 The black dots are volcanoes, the black lines with spikes are main fault zones while the purple lines are geosyncline trenches (folds in the earths crust). The different colours represent different eras in geologically history. 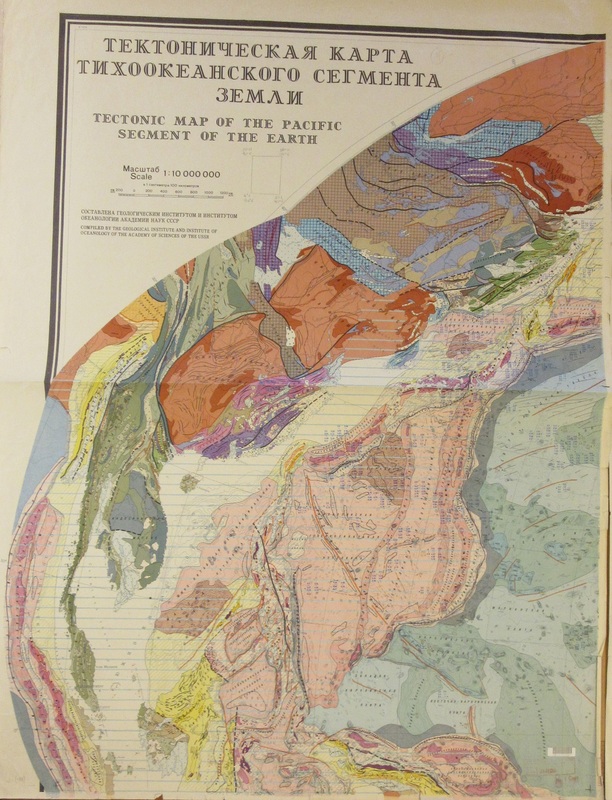 At the time this map was published the concept of tectonics was going through major changes. The discovery, made after important mapping surveys of the oceans floors in the 1950’s and 1960’s, of seafloor spreading (where vents on the ocean floor bring up rocks from the earth which slowly, very slowly, spread out until they meet the edge of the continental shelf and disappear back into the earth again like a conveyor belt) led to the somewhat grudging acceptance of plate tectonics in the mid-1960s. Tectonic plates are a series of large and numerous smaller plates that make up the surface of the Earth, and it is the movement of these plates that creates areas of weakness in the Earth leading to, amongst other things, volcanoes and earthquakes. Plate tectonics and continental drift explain a great deal about the Earth; how South America looks like it could join up with Africa like a giant jigsaw (something which has been puzzling people since the 1600s), how fossil strata and rock formations match up in countries separated by vast oceans, how the same rocks are found on shores thousands of miles apart. As Bill Bryson notes in his book A short history of nearly everything the acceptance of these theories suddenly meant that ‘Geologists…found themselves in the giddy position where the whole Earth suddenly made sense’. The volcano of Krakatoa, the black dot at the northern end of the orange line, between Java and Sumatra. 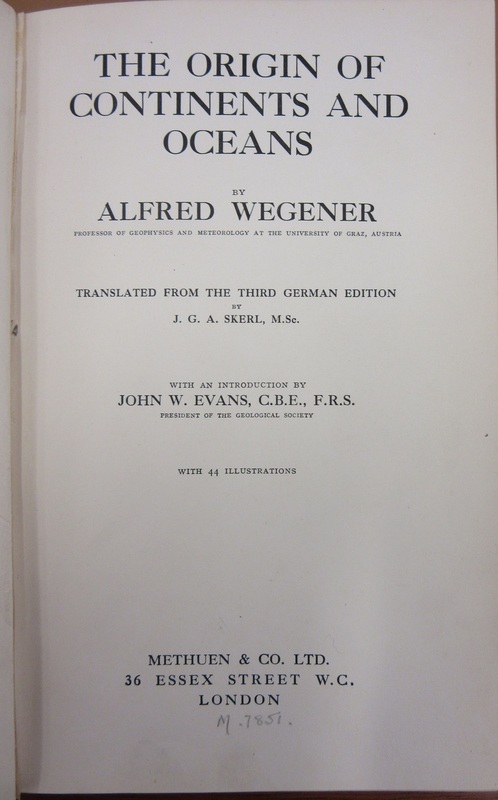 Wegener’s theory didn’t go down well in the scientific community, not only going against current thinking but also coming from someone working outside the relevant disciplines, Wenger after-all, being in their eyes only a weatherman. This extract from an atlas published in 1849 shows the volcanic activity in the Pacific area, with the red dots indicating active volcanoes, the black inactive. This map shows how the Pacific plate, which runs along the line of the activity, was evident even if Scientists of the day were unaware of the concept. This entry was posted in Uncategorized on 1 November 2018 by stuart.